Are makeup setting sprays really that necessary as a finishing step? For a combination skin girl living in hot, humid South East Asia, that would be a YES! Saat Insight is a relatively new Korean make up brand, therefor it is relatively unknown to foreigners. Can i just give a moment on how beautiful the packaging is? There is some high claims for this products and it sounds like too good to be true, doesn’t it? The powerful fixer maintains the fresh make-up all day long. Forms a cool and fresh moisture film that provides moisture. Smoothly adheres and tends the skin bright with a gentle glow. Spray before and after makeup, in a T & O shape more so to get on to the T zone and edges of your face. I’ve been testing it for the past month, during which I had to run errands and go for interviews during mid day. Not only has it been warm and humid, there has been mild rain during a couple of days as well. In regards to setting spray, i have had experiences with Urban Decay’s setting spray a few years ago so i know more or less how it should work. First thing first is the spray nozzle distributed the product well enough. I have no complaints. 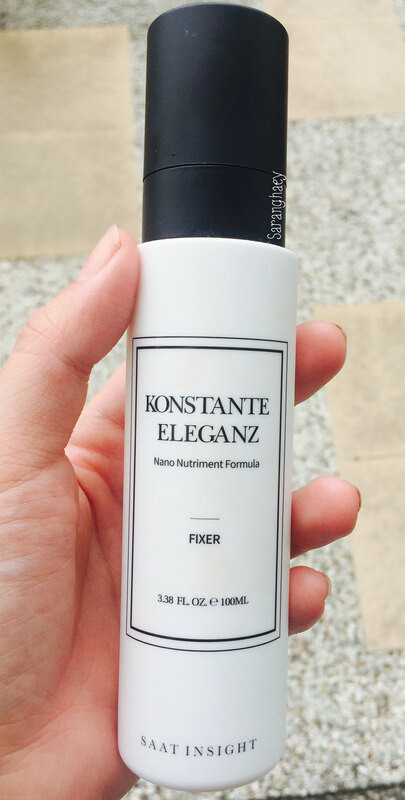 This product actually can transform your base makeup to a dryer, more powdery finish. With matte foundations such as Etude House’s double lasting foundation, my combination skin felt tight on my smile lines and around the inner corner of the eyes where it is usually dryer. With BB creams and cushion foundations that are has a dewy finish, it sets them like how a setting powder would. I would repurchase this product after i am finished with this product, as i personally do not like setting powder that much, as i feel like it will hinder the re-application of concealer over them. It is more suited for people with oilier skin that live in hot humid countries or summer time.